We link to a lot of technical articles on how Postgres works — this one talks a little more on all the other facets of Postgres. A look at some new PG 10 features including native partitioning and multicolumn statistics. How CRM service Affinity moved a large volume of data to a “more suitable datastore” given their query patterns. 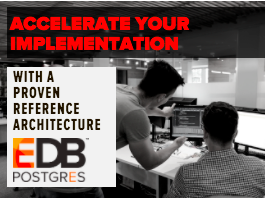 Accelerate the implementation of your EDB Postgres solution with our Enterprise Readiness Service. We will help you plan and deploy an optimized Postgres implementation, customized to your needs and your environment. A new (paid) book by a PG committer that’s aimed not at DBAs but application developers who want to master Postgres. Google’s cloud SQL service has improves its Postgres offering with support for high availability and read replicas, plus instances with up to 416GB of RAM. Less of a blog post and more of a small novel on how to implement your own idempotent API keys directly in Postgres. All of it is a great read. Postgres keeps a lot of information about your database in some of its stats tables. This post walks us through some of the details it retains about vacuum. How to perform partitioning of a large table that’s actively used in production with a Ruby on Rails application and not lose any data. An oldie but still goodie on all you need to know about how caching in Postgres works. Learn how we built the fastest growing open source TSDB.